You will better understand what to look for when purchasing life insurance, along with the general purpose of life insurance and the many different needs it can fulfill. For most people, the difficult decision is not “if” they need life insurance, but “how much” life coverage they need. It’s a much bigger decision, and one that can lead to consternation over the purchase decision if it is not made with the proper consideration. Buying too much life insurance has always been a concern for people who don’t like paying for what they don’t need, and buying too little insurance can lead to a lot of sleepless nights and disaster for the surviving family. Feel free to visit our website, insuringincome.com, where you can find life insurance calculators and instant life insurance quotes. 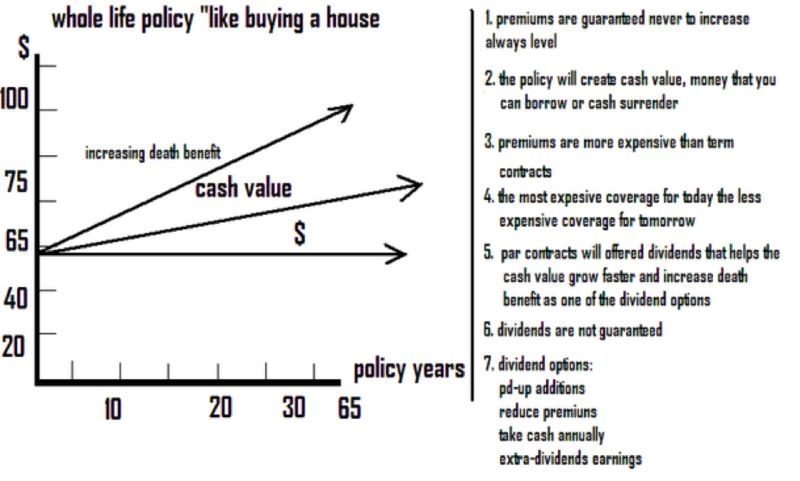 As the graphic illustrates, a level term policy can provide a level death benefit for a certain period of time – i.e., to age 65, 10 years, 15 years, 20 years, 25 years, or for 30 years – after which your premium stops and your death benefit stops. If, at the end of that period of time, you still have a need for life insurance protection, you would have to renew the coverage at a much higher rate, often prohibitively high; that is if you are still insurable. Permanent life insurance, also referred to as whole life insurance, is designed to provide protection for your whole life. As long as the premium payments are made, it will continue to provide protection and it can never be cancelled. 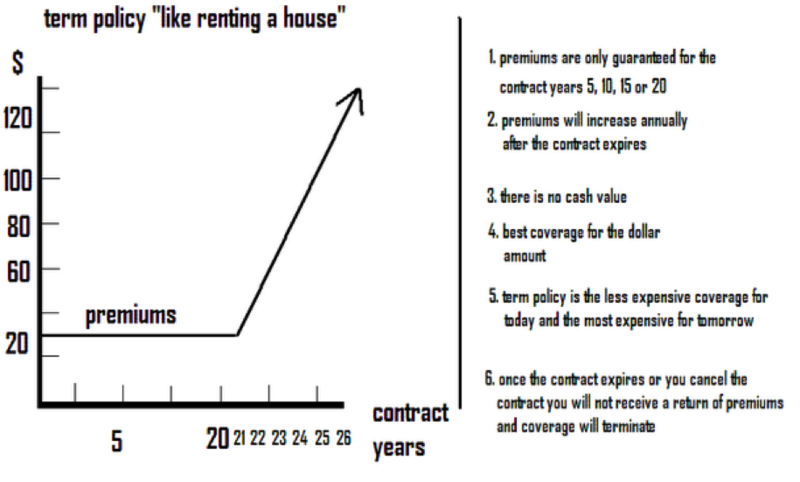 As the graphic illustrates, a typical whole life product starts out providing a level death benefit that, when a level premium is paid over time, will increase. This is due to the cash value element of whole life which guarantees a minimum rate of growth on the portion of the premium that isn’t applied to the cost of insurance. Because there has to be a certain space between the cash value and the death benefit, the cash value growth automatically pushes the death benefit higher. Once you initiate the buying process with a life insurance provider, the process takes on a life of its own. It begins with the completion of an application, so it is helpful to have all of your financial and medical information at hand. The application will ask you about your current financial situation and it will inquire about your medical history. You will also need to agree to a release of your medical records. The application is also where you will begin to piece together the different components of your policy, including the death benefit amount, your beneficiaries, policy riders, dividend options or investment selection, and you mode of payment. The application is submitted for review by underwriters. If a medical exam is required (this will depend on your age, the amount of life insurance, and your medical history), it is scheduled. The exam is usually done by a paramedical professional who comes to your home or office. Your exam results are submitted to the underwriters for review. After all of the medical records and the exam have been reviewed, the policy is issued. From the time of application to the time of policy issue it can take from 60 to 90 days depending on how quickly your medical records are transferred. After you receive the policy and pay the first months’ premium, you have free look period of 30 to 60 days to carefully review the contract and the policy provisions. Find a reliable life insurance specialist with whom to work. They will take on the responsibility of getting you from application to policy issue with the least amount of friction. They can also be invaluable during times when you need any sort of service on your policy. It can be critical to work with a company that can go to multiple life insurance companies as health history can cause one carrier to approve with a less than favorable health rating.